Video games have become increasingly more popular to the point where both male and females have developed an increasing interest. But for many people video games are only a hobby that they get to do on their free time. Gamers are like everyone else though, they want to make money doing what they love. “Can I make a living playing video games?” is a popular question among a younger generation of gamers. The answer is a simple yes, but it is a yes. 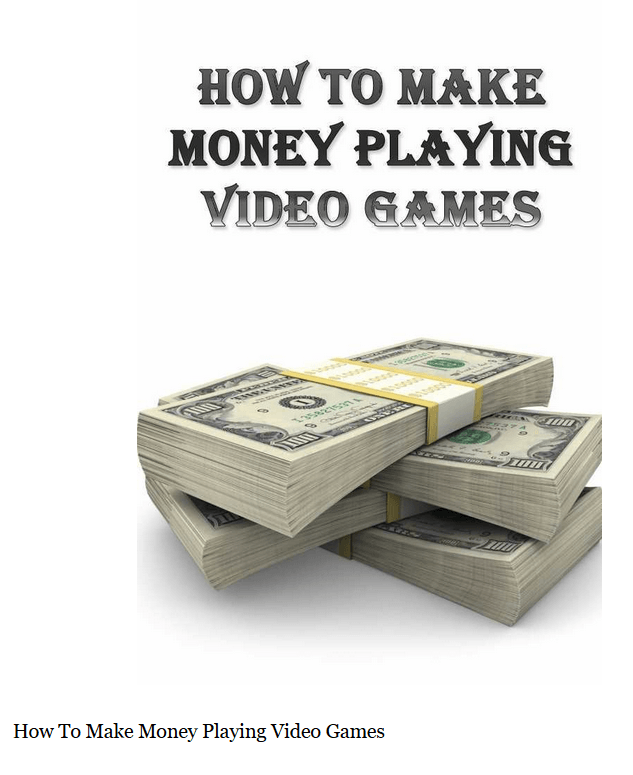 It is possible to make money playing video games but it isn’t easy. The most common thing that people think of when it comes to making money playing video games is game testing. Game testers are hired by companies to play games for a collection of purposes. Games need to be tested to find any potential problems with the game that are only found when used on various systems and played through by users who aren’t looking at the game every day during development. Game testing also allows developers to get a gauge the reception of the game from a gamer’s point of view. It is extremely rare for people to make a living testing video games though. There have been several books written on the subject including this one below that has some great tips. At a cost of only 99cents it is definitely worth checking out. It is far more likely that you will make a living playing video games if you start letting other people watch you play video games. There are two different ways to do this. The first is to stream your video game experience through Twitch. Twitch is a service designed to allow gamers to watch other gamers play their game live while a video of their webcam accompanies the stream. Twitch allows streamers to earn money by earning subscribers. It is a lot of hard work to get to this point though because you have to start to make people want to subscribe to you. How do you do this? You provide them with more than just something to watch. You provide them with an experience. Just like a television show you want to put on a production. Viewers can talk to you via text while you play and you can’t forget to interact with them. Streamers can also earn tips. Tips can be just as hard to earn as subscribers. People only tip if they are enjoying the show or if streamers react to it. Many people will tip streamers if the reaction to the tip is entertaining. Reactions can vary from excitement to over the top gratitude. By trying to make a living by playing games on Twitch you are committing to be an entertainer and personality. There are a variety of people who have done this such as “Trump”, “Leah Loves Chief”, and “Pro-Tech”. The other way to make money playing video games is to record videos of yourself playing to post on YouTube. These videos can be regular video game playing or even instructional. YouTube gamers make money by posting videos regularly and allowing YouTube to place promotional content at the start of the videos. For every so many views that a video gets the YouTuber earns money. A lot of people have found this as a successful way to make money or even use it in conjunction with a Twitch streaming account. If you can create YouTube videos of yourself gaming it unlocks the ability to earn a passive income while you aren’t even playing. In today’s world almost everything is recordable and you can easily capture yourself playing video games. While it is possible to make a living, even a good living playing video games, it isn’t easy. Playing video games for a living also involves more than just sitting there playing games. You will still need to put work into it. Many people try to make money playing video games and don’t succeed. The best way to go into it is to formulate a plan and work on it from there. Another good suggestion is to start off small and only plan to make a part time living off playing video games. From there work on it until you are making a living.